It all started with a toothbrush.... Mrs. Lore befriended a woman named Connie at St. Mary Church in Mokena, Illinois who had placed a large shipping carton in the narthex of St. Mary Church. She was asking for donated new toothbrushes. (Some people actually have donated used toothbrushes in the past-which are thrown out) She, Connie, has been Dr. Cahill’s dental assistant for more than 27 years. After several months, Lore got her school, Hazelgreen Elementary, to host some of the children who were then medical evacs. 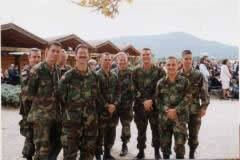 Soon we were asked to help by actually going to a war zone in former Yugoslavia to a town called Medjugorje. They needed people, not to take their suitcases, so that dental supplies would be taken in lieu of their two allowed suitcases. My wife told me that we were going to Bosnia, in October ‘96, (11th-22nd) with a team of dentists on a humanitarian pilgrimage to set up a single mobile dental clinic there. This mobile unit was put in the war zone by Fergie, (Prince Charles ex-sister-in law). There were nine in our party: two dentists Dr. Richard Cahill, and Dr. Janice Lubas; her aunt, a retired nun, named Anita; one dental assistant, Connie; and her then 14 year old son, Mike. My brother, Don, and his wife, Suzanne, who had flown in from New York joined us for our trip to Europe, from Chicago. Plus my wife, Lore, and myself George . The mobile dental clinic was then in a refugee camp, called Domonovici in Capjlina, Bosnia-Herzegovina. There were riots there on October 1998. NATO command, (in Oct.’98) said it was a poor police department, which caused the riot. On later trips they realized that there are less custom inspections if suitcases are used in lieu of shipping cartons. All nine in our group did the same so we were able to take a total of nineteen large shipping cartons of dental supplies and several small machines that mix the fillings for people’s teeth in lieu of our suitcases. We each traveled with only an overnight bag, or carry-on. Dr. Cahill asked me, while airborne over the Atlantic, to put a transmission in a Ford van. Dr. Cahill further explained to me that this transmission was already in a crate in Bosnia. He told us that he wanted Don and I to have something to do while we were in Bosnia. They had dental things to do. This transmission had already been donated by the Ford Motor Corporation to Miss Moira Kelly of Nobody’s Children. How I felt at that moment will not be mentioned, having only brought a single screwdriver and a Swiss army knife. Having previously asked, weeks earlier, if we were to bring along any other tools. We had been told that I was going to be the electrician on the trip to bring power to the mobile unit, which was fine with me. My attitude was, before I went, that I was going to work for the Lord and whatever He gave me. I was willing to work with a smile on my face. I never dreamed however, that I would be asked to do something, which I had never done before and certainly could never do alone, without the proper tools, fluids and lifting equipment. My experience on transmissions was limited to a cork clutch on a ‘29 Essex, with my high school friend Saul Katz. I was wondering why was I even on this plane with these types of people who could ask something that could not be done by Don and I. What was I to do? I wanted to exit the aircraft I was so upset. We left, for Bosnia, on a Thursday afternoon from O’Hare International Terminal. While waiting for the Swiss Air ticket agent to take our 19 shipping cartons, a man offered to pay 100% of the cost of the excess freight for the 19 shipping cartons if any were over the 10 kilos each (37 pounds) allowed for free. Two per each individual person. Plus full freight for the extra or lightest or the19th carton. Dr. Cahill accepted his kind and generous offer. All but one carton was overweight. His mom was on our same flight to Zurich, our first stop. The extra freight cost was just under $100.00 American. I am allergic to most edible nuts. All the peanuts, upon our request, were served to the first class customers instead of our section as originally scheduled. The lovely Swiss Air person served all of the coach class pretzels, which were originally scheduled only for the first class section of our plane. The mobile dental clinic was one of three, to date, brought into Bosnia. Another is in Mostar as of January 1997, also sent to Bosnia by Fergie, the former wife of England’s Prince Andrew. Two units were operational; this third unit was already there, but without power, water, equipment or lights. To make a long story short, it was running by that Wednesday morning. On our first weekday, Monday, Don and his wife Suzanne, Lore and I traveled by cab to the home of Vicka, one of the visionaries who claim to have apparitions of the Mother of Jesus. All around the area, including the neighbor’s properties, the fields and plant life had already succumbed to the hard frosts of that fall season in those mountains. All of the vegetation, former living crops, mostly corn and grapes were brown and lifeless in the whole valley. They all stopped growing tobacco after GOSPA told the children to stop growing tobacco. But as we exited our taxi we were at the home of Vicka. We saw Vicka speaking to a group of pilgrims, as she stood under the green grapevines that climbed to the veranda of her house and her grapes were ripe, as in summer. This one stark event took all of us by surprise. We all then realized something different was going on here. Lore picked one of the vine leaves and put it in her purse. Upon our return she gave it to her cousin, Rosalie in Lockport, Illinois. Three years later that leaf still smells of roses and is now yellow. A week later we learned the name of the man who was translating that morning. His name is Franyo, who was doing the translating into English that day whatever was being said by Vicka. He did this each day at 10:00. Someone else translated into Spanish & German at other times each day for the people who came from all over the world to that street in Medjugorje. We then walked back along through a nice path between the tied down cows and vegetable gardens directly towards St. James Church, which then stood alone in the valley. I stopped to take a picture of this old Bosnian looking woman who looked worn-out from picking potatoes, like I had seen in Germany when stationed there thirty years ago. She then asked me in English where I was from. When I told her Frankfort, Illinois she said, “I’m from Chicago” I asked her: “Where in Chicago?” she told me Narragansett on the near North. To make a long story short she lives across the street from Industrial Steel & Wire Inc. where we go to once or twice a month to pick up wire or rod. Having the knowledge to be the one to have the prior expertise of knowing that all new compressors needed oil, and not the electric motor that drove the pistons in the compressor by a “V” belt was a real joy. Dr. Cahill allowed me to do the proper oiling of the new compressor. This compressor was used to deliver air pressure to the drills in the mobile dentist clinic. When we landed at the Dubrovninoc Airport the first people we saw were nine, fully armed, American G.I.’s who were at the bar as we exited the airplane landing area into the airport building. Seeing and taking pictures of them was a joy which I will never forget. We got off of the only plane at the whole airport (easy target was my only thought) While in Bosnia we were able to visit some of the families of some of the children, and parents who had traveled earlier, that year, to Illinois for medical help. Care For Children and others had hosted these people the previous spring. These children had been brought to the United States for medical/dental treatment. Most were war victims, needing prostheses as a result of their amputations. After Connie and Dr. Lubus got the compressor to run, it vibrated and cut the air hose to the drill used by the dentists. Mike and I were asked to fix it the next day when we were there. At this point (Thursday afternoon) I now knew the Lord was with us in everything we did. I also knew, do not ask me how I just knew; the answer was in the empty field near-by. So I walked out into the compound and found the only cinder block or cement building block, which was in that whole compound; it was broken and had only one flat spot on it. Upon carrying it over to the little compartment, it fit perfectly between the wall and the compressor tank. The air tank was then stationery. Maria, our host where we lived, had a teething baby and Lore had the cream for just such a problem in her purse. Maria asked Dr. Cahill, How often should she use the cream?” Dr. Cahill took the cream back and read from the label. “Use every 4-6 hours and consult your physician.” Dr. Cahill then said: “You have been consulted.” The Bible says Heaven will be like a wedding reception. Well, go to Medjugorje. You now have 36 (updated through 1 October, 1997) countries sending their best boys for the IFOR operation now called SFOR as of 1 January 1997. You have people traveling to Medjugorje thru a “war zone” only to find their own countrymen in uniform patrolling the area. They then attempt to thank these men by buying them beer and pizzas. So in the process of the Greeks thanking their Greek GI’s, the Brits, the Germans, French, Spanish and 34 other countries and then the Japanese are also seeing the joy in the land. It is so wonderful until you leave the town of Medjugorje and then see the physical devastation everywhere else. One morning we were at the Franciscan Orphanage, “Mother’s Village”, near Medjugorje. Their current Web site is: www.nibcomp/mvillage/letter.htm We were looking at the property where Dr. Cahill was going to have a new permanent dental clinic built. (It did open 1 March ‘98) Dr. Cahill motioned to me to be with him while he stood behind a nine-year-old boy named Matte. I was asked and was standing in front of Matte. He then, while standing behind him, put a new retainer in Matte’s mouth. We had to be outside, for we were not allowed inside the new school. The reason for this is that all of these grade-school children had lost one or both of their parents, and strangers were not allowed in the building when the children were present. Many were still traumatized from the loss of their parents. So a nun had walked Matte outside, in the cold wind, as Matte saw Dr. Cahill, who had previously measured and taken an impression of his mouth. Matte was upset in my opinion. This had been done the previous May ‘95, on Dr. Cahill’s last trip to Medjugorje. Being that Dr. Cahill is deaf, he wanted someone to listen for a “click” as he put the new retainer in Matte’s mouth, outdoors in the wind. I heard a “click” and Matte broke from Dr. Cahill’s arms and ran toward the door about 75 feet away. He then stopped and walked back and stared at me. Then without saying a word I took out my retainer and put it back into my own mouth. He then gave me a smile I will never forget and ran back into the school. I then felt such a wonderful joy and reason for being there, having shared in silence that smile from a boy who was now no longer going to be ridiculed by his fellow classmates, for having only one front tooth. The nun had told us about Matte’s low self image prior to his coming outside to see if his new teeth would even fit. Also, I will never forget Dr. Cahill’s look on his face looking at my face, prior to sharing with him the fact that I did hear a click knowing if it had fit. What an honor to be there for both of them at that moment. This whole morning was before Lt. Long came into my life and Dr. Cahill thought Don and I would not have enough stuff for us to do on that trip to warrant a desire for a return visit. While waiting for our pizza and a second beer, in the shadow of St. James Church, I traveled from table to table thanking all the American G.I.’s for being there. The Americans at each table were from different units and did not necessarily know the other American’s at other tables. 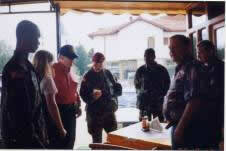 There were many men from many units or IFOR units in the open-air restaurant. This restaurant had a hard ceiling and open walls. Also several French and English pilgrims were also thanking their countrymen for being there. I was asking if anyone could help me with my burden of getting the transmission changed in the van belonging to “Nobody’s Children”. Then a “humvee” pulled in with four Americans aboard. Upon approaching their table, before they had even sat down, I was greeted by two G.I.’s who pulled their 9mm pistols as I approached their table. While looking towards the sun I was not able to see the rank of the man to whom I was then addressing. He was the only man without his pistol pulled. While we all were visiting, and re-supplying a dental clinic that Dr. Cahill had set up on an earlier visit, which was inside the beautiful “CAMPO della VITA” which is a drug and or alcoholic re-hab center. Their current Web site is: http://www.campo-della-vita.org/inglese/history.htm this center was built by men who after making the decision to rid themselves of their addictions where given three things: a pick, safety glasses and a hammer. What they have built is more beautiful than the castles of Germany. The painting above the altar, and the stonemason work is so colorful in addition to being neat and clean inside. Five two story buildings were built as of ‘96 when we there. While all of us were standing outside ready to go back to Medjugorje, the male secretary of the Parish of Medjugorje tapped me on the shoulder. His name is Franyo, (the same man we saw the first day translating for Vicka) who upon hearing earlier of my work with the IFOR troops the day before, asked if I would let him drive me back to our “home” alone. While driving he asked if I. would travel with him that Thursday night to make a map of the other American vans which were not working in the area. “Sure, I would be honored to travel with you,” I said. To hear him say: “I now know you are the man we have all been praying for” was a very, very scary feeling. Now in my fifth day of miracles I was too frightened to say no. Having just seen what the Lord can do with men who the world would not give honor to; build that little town of solid rock buildings. To see the beauty of the work the men have done at the re-hab center chapel would have been enough to make the trip worthwhile. That night Franyo came back to the house that we were staying at and I left with him alone that cloudy night in his little 13” tire sized tiny little Yugo. Only the Lord knows that many years ago I promised myself that I would never get into a car named Yugo anywhere; death traps, in my opinion. The Lord has a sense of humor. Would you believe we were in a Yugo at night in former Yugoslavia with no lights on so we would not be shot at? Franyo turned off the lights as we left Medjugorje. I asked, “Why did you do that?” “So we would not be an easy target”, he said. He has a son named Kristian and I also have a grandson named Kristian. He had surely picked up on the fact that I was not happy being with him at that moment. He then started to sing in English The Battle Hymn of the Republic, which I like to call Republicans. I joined in and nothing was going to stop our mission. In the movie Blues Brothers they say they are on a mission from God. I could barely control my joy in being honored to take notes, that night, so to be able to make a map later. My only thought was I was glad there were no lights on for I was crying like a baby while we were singing. I was so happy I was allowed to serve Him in this way. The clouds that were covering the moon instantly parted; they did not move away, they parted. I am telling you they went three different directions away from the moon, and the full moon shone on the road and my note pad so we did not hit any more pot holes or bomb craters; for Franyo could now see the road clearly the rest of four hour trip, that night. I faxed “my map” or the info to LTC Mark L. Long’s office from my office in Frankfort, Illinois eight days later back home in the USA and heard nothing. Five weeks later Moira faxed a letter to me saying the troops are still working for them and other missions. What a joy, jumping around my mobile office knowing that Boy Scout training was finally used, after 40 years. It was neat having only the moon as a fixed point during that night and Franyo’s kilometers on his dashboard as a marker or reference point. Plus I only had earlier decided that I would go to Bosnia if there were a full moon in case I had to sneak out of the country with my spouse and brother Don and his wife. But the Lord took care of my stupid sinful fears--Big Time. Outside St. James church the following day, my brother, Don and I also befriended ten U.S. Navy pilots of lieutenant rank who fly our P-3’s. (Navy lieutenant has the same double silver bars as captains in all other services in the U.S. Forces.) I asked them how come ten captains were hanging around together. They were upset that they were noticeable. Who would not notice ten tall young men all dressed alike, full Navy dress uniform with the same officer rank, each not more than a foot away from each other in a crowd of civilians! We have pictures of the all of these men outside St. James Church in Medjugorje. They flew our P-3 Orions. We are still debating in our family if this was another miracle, for our own only son, so far, really enjoyed seeing the pictures of the men who flew the planes that he had been in charge of as the TI and Forman, which were rebuilt and he had been inside the wings and sweated over, in the hot Texas heat during the summer of 1995. I did tell these pilots not to make sharp turns for the Lockheed planes had microscopic cracks that were not known with the metal technology of 35 years ago but they were still airworthy today. They did not know weather to laugh or cry, with this news, but it was just another blessing to be able to share with them the truth about the NATO planes they were commanding. During lunch Wednesday with Moira and all our new G.I. friends, one of the GI’s from South Carolina inquired about Moira’s work with Mother Theresa. Moira said she had enjoyed the south Bronx more working with a wonderful nun named Mother Monica for more than two years just prior to coming to Bosnia. I then asked if this was Mother Monica Archer, to which Moira was surprised to hear that I knew of her last name and how did we know her. I replied, “She’s my aunt.” Don said (as soon as he could lower the beer glass from his face) “She is our aunt!” Moira then proceed to pull me to my feet and dance with me for joy around the restaurant to my full embarrassment. Where, of all places, Bosnia, to meet Moira? The interweaving of God’s work was the incredible miracle-- a divine plan wherein we were allowed to be His instruments, is the biggest most incomprehensible miracle of all! Lore later faxed Moira a copy of the newsletter from the Urseline newspaper with Moira’s face on the front page. This newspaper Lore “happened” to keep for several years in her “stuff”. I can no longer be commenting about all her stuff now. The great Bob Dufford’s, S.J. (S.J. = Jesuit, for my fellow Christians -Society of or for Jesus) “Be Not Afraid”, third stanza: “You shall speak your words in foreign lands and all will understand You shall see the face of God and live.” During our trip Lore could understand and speak Croatian with her knowledge of Polish, French, German and English. This allowed her to give instructions, which were completely understood to the many men, women and children in the compound who were waiting to enter the clinic. Most were in pain from six years of war and no dentists or doctors. It took from Monday afternoon until Wednesday to get the clinic operational with the supplies and equipment we had hand carried in from Illinois. The Lord was with us this day also for it was miracle after miracle that we were able to get everything up and running. The power of prayers being answered at the moment our friends were praying was unbelievable, or proof of His love for His children. We also traveled to Mostar, in Moira’s van; otherwise we would be shot at. They do not shoot at Moira’s van painted with a logo on the side of the van for her organization helps all children from anywhere get professional help. We visited some of the families of the children we (the organization we were with, CARE FOR CHILDREN) hosted in Illinois earlier that year. They lived in East Mostar, where the Muslim section had suffered the most. This apartment complex had no running water, electricity, heat or windows at that time. There was also a mandatory curfew during that time. These people had so little, yet they shared much with us. The hostess ran to neighbors to borrow glasses to serve us Pepsi, since they owned only one glass. We were treated as visiting royalty with cake, kaffa, fried chicken, and spinach stuffed fried cakes. We knew they would have to do with less lately, but we could not refuse their hospitality. It was wonderful to see the children again, but very sad to see what they had to return to. Things we take for granted here are nonexistent there. I had first met the father of the boy who had a new ear attached at Christ Hospital in Oak Lawn, Illinois at the Oak Lawn ice arena and was the first person to speak to him in English. Well, to all gathered, he did speak English and it was a joy to see him again, and now he was employed at the local hospital again after six years of unemployment during the war. Dr. Cahill had arranged a new ear for their son at Christ Hospital in Oak Lawn, Illinois and wanted to physically check on his ear to make sure it was ok-which it was. One old lady was following Lore around the camp where the clinic was. For not less than fifteen minutes before Lore learned that all she wanted was to have Lore take her picture. She told us that during her whole life, no one had ever taken her picture before. Once she was “immortalized” she graciously thanked Lore and left. Lore later sent “Ruszka” her picture. Her picture appeared in Dr. Cahill’s newsletter in the summer of 1997. While in Bosnia, we stayed in Medjugorje, a peaceful haven within the war zone. Medjugorje is the village where Mary, Virgin Mother of Jesus is, we believe, presently is appearing. What a brief taste of heaven this journey was. It was a journey of unfolding miracles, ever present and still continuing. Four of the six visionaries were present in Medjugorje during our stay there. We met Vicka, Marija and Mirjana. We were blessed to be present during one of Marija’s daily apparitions, witnessing the peaceful calm of the entire experience. Afterward, returning through town, we saw two cloud formations clearly looking like two angels blowing trumpets. The outlines of the clouds were as distinct as if two cookie cutters were at work in the night sky. These were the only clouds in the evening sky that night. We experienced ten days of miracles too numerous to keep track of although we seriously attempted to do so. Don and I were able to relieve young Mike of several rounds of 7.65 mm NATO ammo he was given by a boy who had lost his dad in the recent fighting. This ammo was his most revered and proudest possession from his dad’s ammo belt. So when Mike laid out these “gifts” of 55 year old NATO ammo, (NATO AMMO IS DATED ON EACH SHELL) on the dinner table, Dr. Cahill, Don & I were able to instruct all present of the dangers of this ammo and get rid of it. That is a story in itself after the German NATO troops hit the deck, and a black GI ducked behind a sandbag bunker as I approached them with outstretched hands. We later ditched that ammo and other smaller caliber ammo in a fast moving river from the center of a two-lane bridge the following morning. One afternoon we noticed several tour buses loading people into them. Also all the taxis were full and we inquired where everyone was going. We found out that they were going to hear Fr. Jozo speak in another town about 35 kilometers away. While we were standing there a woman asked if Don and I wanted a ride to hear Fr. Jozo. This woman is an aunt to one of the visionaries. She was our personal tour guide and in charge of two bus loads of people, that day. She had her own car. While listening to Fr. Jozo speak for two hours, the same priest who was portrayed by Martin Sheen in the movie GOSPA, we heard him say if you want to really do the work of the Lord, take your TV and cover it with a blanket and put the Bible on top of the TV and to also read it daily. This is Biblical in not allowing filth into your home. He also said, “If you have not memorized the Bible, you better have it with you.” which is the same phrase I had heard at Soldier’s Field in Chicago at the Promise Keepers conference the previous July. For me it was another connection of the universal church and just another sign that the Lord Jesus and the Holy Spirit blessed all of this. Lore and Sue had purchased bus tickets to go to hear Fr. Jozo and we met them there to our surprise. After he spoke most of the visitors walked to the edge of the parking lot and into the apple orchard and then back down under the parking lot into a old wine cellar to visit the place where the Nazi’s had executed, in one day, 144 Franciscan priests and seminarians, during WWII. All visitors were moved to be in the place where so many martyrs were killed. The Serbs tortured Fr. Jozo himself as you can see in the movie GOSPA. Since the WWII over 1,OOO men have now joined the Franciscan order to become priests in the Catholic Church from Siroki-Brigiej area alone. When Don and Suzanne arrived home in Bronxville, N.Y. there was a rose blooming near their front steps. There has never been a rose blooming there in the 32 years they had lived there. This rose, Don says, was identical in color to the rose they saw blooming outside their “eleven day home” in Medjugorje. This rose stayed in bloom until 8 December 1996, which is the Feast of the Immaculate Conception as celebrated in the Roman Catholic Church. Don says the full rosary on the New York Central railroad each morning and evening. Other people have said, “You must have been to Medjugorje”. Don now calls the train seat “his pew”. Today Mr. O’Grady travels around our country, usually at Marian conferences, telling of how his mother prays to the Blessed Mother and how she & he prayed while in Bosnia eating ants for eight days. Before we left Medjugorje we had a private interview with Mirjana. She repeated Mary’s frequent message of requesting daily prayer and Mass, reading Scripture, conversion (trying to be better each day), fasting or giving up something you like if you are unable to fast, do confession and reconciliation. The people of Medjugorje begin and end each day with Mass and pray three additional hours in church at the end of each day. They have been protected during the war near them with no human casualties or destruction to their village. On the flight back from Zurich we saw the movie “Twister” and when the tornado was going through the drive-in movie scene our 747 was passing through a real northeaster over Quebec (that storm had hit the United States). So the movie had screaming in it at the same time the German teenage girls on our plane were screaming from fright on the 747 going down, then up, and side to side. This trip brought us so close to the Lord. I only hope you get to know Him as we have. Medjugorje was a brief taste of heaven, an experience we will never forget. We hope to return again, Lord willing, to continue with the humanitarian task as well as to continue our personal religious pilgrimage--a personal renewal and focus of our true journey here and beyond. Over three years later we are still seeing how our trip was used in the Kingdom of God to tell of the blessings of the Lord. Very sadly there are still many Christians who believe Mary, the blessed Mother of Jesus, is dead. Others have closed their eyes to the miracles of Fatima and Lourdes and are not interested in hearing of the physical truths of our trip. Pray for them. 19 February 1997: The new dental building in Medjugorje was started. Mark L. Long III had a Spanish contingent of the NATO IFOR troops build the foundations for free. Mark stayed until 17 December to make sure the foundation was dug in the rock. This was his first Thanksgiving away from his wife. Even while serving in Viet Nam he was able to be home for Thanksgiving on his two tours. He chose to stay and get the clinic foundation started. He has given me permission on 2O February 1997 to use his name in this story. What an honor to be counted as a friend of his. He is living his faith, as are so many people we have met then and currently. Mary’s main messages are to pray from the heart and not from habit. Everything we saw and heard has taught us to put Jesus first in all things, including prayer. No bomb dropped from any plane ever exploded, in Medjogorje. No one from Medjugorje died during the three-year war even when in other parts of Bosnia. The bad news is that both Lore and my cholesterol levels went up 30 points in only eleven days. We did enjoy the banana splits, which were made with chopped pears, raisins, walnuts, dates, and plums as a bed for the ice cream and bananas. We ate three times a day, ran, walked miles, climbed mountains, hills and carried tons of stuff from taxis to clinics, vans to clinics, cried, cried and cried some more, each time we saw a child without limbs, eyes, hands jaws, parts of their beautiful faces rearranged, kids playing soccer with soccer balls without air, dogs playing with rocks. All phone lines pass through the police stations except the cell phones, which are everywhere, monitored by the IFOR, you can bet on that. It takes only one evil person to put a land mine in a pothole, kidnap another in the middle of the night, and blow up a home or to start the rage of revenge anew. The tourists do allow over 4,000 orphans and others to eat three meals a day. The food comes from Italy via car ferries full of cars with all the things for war and peace to continue. While over they’re my brothers, Don, and I together climbed the tallest mountain in that valley one afternoon. Most of the visitors to Medjugorje do this. Many do it barefoot. While near the top of Mt. Krizevic, an old lady stopped us and sang our “God Bless America” (FIRST STANZA) in its entirety. We then asked her why she was singing this for us. Her reply, in English, was “you stopped the Nazis when I was a young girl. Now you stopped the Serbs when I am an old woman.” We all cried together. A few moments later we reached the top where the 35-foot, 14,000 lb. cement cross is. It was built in 1933 on the nineteen hundredth anniversary of the crucifixion by the local residents of Medjugorje. They hauled up, buckets of cement, the mountain and the whole mountain is loose stones and thorns, but the rocks are everywhere. They do not even have much dirt to grow crops with. How much do I love my brother, Don? I would not go to Bosnia without him, a Viet Nam vet, knowing he and I react the same way to real and perceived threats, as do my other two brothers Mike and Bill. Worth mentioning: The night we were traveling (daylight to darkness on a VW bus) from the airport, in Dubrovnik, traveling towards Medjugorje we had now been traveling 27 hours with no sleep and we were exhausted. We had all also worked a full day prior to leaving, for we left in the late afternoon, Chicago time. Our two vehicles were stopped at a guard post by a huge goon as tall as any Chicago Bulls basketball player, but with a larger build. The white and red striped pole, across the road, with one light above it was right out of Hollywood, but it was real. Nearby was a metal shipping container like you see on the freight trains in the USA. This shipping container was cut open the whole length so you could see the girls, the bar, the short skirts, the bar stools. It was dusty, hot, and humid and the Croatian rock and roll station was blaring from the loud speaker. After we pulled over to let the other traffic go by without even slowing down, Dr. Cahill, Connie and myself got out of the two vans to see what they wanted. To those of you who have not seen “The Dirty Dozen” (the movie) with Lee Marvin, Charles Bronson and Donald Sutherland, this may not be appreciated as by those of you who have seen this movie. Remember Uncle Don still had his Viet Nam Veterans of America hat on at all times. We were all exhausted and trying not to fall asleep in the hot dark & crowed van. After a while, nothing was happening for Dr. Cahill was not going to pay the hundreds of US dollars in import taxes, or 20% of our estimated $15,000 worth of cargo of dental supplies. Dr. Cahill did tell them “we have $500 worth of stuff here.” These supplies were for the children of his own country, “surely you are not going to tax this stuff”. Kennedi, who was our driver and host at his own home, told the dust covered goon that he was going to tell his parish priest on him when we got to Medjugorje. So Uncle Don, who loves Donald Sutherland, the actor, who had to pretend to be a general while pretending to be a goofball in the movie, “The Dirty Dozen” decided to step out of the van. (Don is 6’2” and his hat is another four inches so you have Don playing John Wayne, playing Donald Sutherland) strolls up to this goon, who is carrying an AK-47 with a rope for a lanyard within two inches of his beer smelling mouth and tells him loudly, in the King’s English, “You’re out of uniform!” does an about face (U.S. style) and returns to the van while giving me a wink as he goes by. This goon looks at his own dirty uniform and at his dusty shoulders and hat. He did not know what to do. The whole edge was gone and the tide was turned; the goose was cooked and my brother, Don, is my hero. Dr. Cahill liked that also he too is a former NATO officer and I am former NATO enlisted. The goon then says to Dr. Cahill, “You can go now for $85 American.” We took a real long time pretending to each come up with the monies, but Dr. Cahill just counted our 85 American singles and gave it to him and required a written receipt, which he got. Up until that moment I did not see why Don had to wear that hat. But that hat has to be the most powerful thing to people in that area. For they did not know Don was with so many Americans in civilian clothes and with the CID, CIA and NATO folks there. It was so good for who would believe it, except we were there. We still read all and print some of the SFOR, now called IFOR briefings we read every day from the Holiday Inn, Bosnia, as received on our computer each day here in Frankfort, Illinois. We FAX to Dr. Cahill’s office in Oak Lawn, Illinois all the printed briefings that include any of the towns that Dr. Cahill currently has clinics in. At 04:00 in the morning we were getting ready and loading two vans for departure for home. Former NATO Captain Dr. Richard Cahill opened up the back of the van and said: “Specialist Fourth Class , will you help me load the ammo for the poor souls in Oak Lawn, Illinois?” He had a suitcase of 1,500 blessed wooden rosaries, which weighed well over 100 lbs. “Yes, Sir”, I yelled in retort, hurting my own ears in the small van. The rosaries were made by the men at CAMPO Della VITA (as copied from their own entrance sign. Started by a sister Elvira from Italy. European governments do not support addicts of any kind like the United States government currently does with social security checks. Later that morning we were driving along the road with the Adriatic Sea to our left and as we approached Split the cliffs were lit from the streetlights of the road in the town of Split in the distance. It looked just like the Disney ride, “Pirates of the Caribbean” except it was so much more. The sun challenging the electric lights to light the wall of rock above the city of Split was striking as the sky above the cliffs went from black to ebony to azure to light blue to sky blue. The beauty of the Adriatic coastline and the shops and boats at anchor was so peaceful when just 40 clicks inland is destruction only the power of the devil could create. Lore and I no longer want to go anywhere except back to Medjugorje. On Sunday, August 10 1997, Miss Chris Coffee a missionary for Pioneers, shared some of her experiences in Thailand from the pulpit at Peace Community Church, in Frankfort, Illinois, and further at the home of the DeBoers for lunch with the whole Missions Committee and their spouses. The next day we received a letter from Moira in Ireland, dated Monday 4 August 1997. On page 2, she stated that she is going to Bangkok, Thailand, Lord willing, to help with the AIDS infected children. Chris Coffee told us the farmers in Thailand sell their children into prostitution. 3 September, Miss Chris Coffee notified me in writing that she wants to meet Moira Kelly when she goes to Thailand. What an honor to be able to bring these two saints, in my opinion, in contact with each other. We now can no longer help CHRIS COFFEE for she has returned to Illinois in July of ‘99 because the Government of THAILAND cancelled the VISAS of all Pioneers. She is a local schoolteacher, in Illinois, as of August 1999. This story does not have an ending. We have hosted a total of five Bosnians, at our home since then. (Two of which were able to get their dad out of Mostar and now live in Edwards, California) We learned from Mario, the translator who lived at our home for four months, how the people of Mostar were fed during the war. The Jewish rabbi’s used a tunnel to bring food into the city. This same tunnel was used during WWII to get Jews and others out of the city when the Nazi’s were there. We have seen Moslem doctors here in Illinois give free care to Christians. We have seen all different races and religious beliefs who are also doctors give free care to war victims here in Illinois. The honor of Mario telling me what a great country we live in while attending the Promise Keepers conference at Soldiers Field in Chicago and seeing black and white men praying together. Our phone rang at 22:3O on 24 August 1999. Lore and I were asked by our dear friend Rev. Richard Plass, the founding pastor of Peace Community Church here in Frankfort, Illinois to speak to a board of inquiry at the Southern Baptist Theological Seminary in Louisville, Kentucky on Monday 29 November 1999 at 13:OO hours. This board was convened to “STUDY THE PHENOMENA OF MEDJUGORJE”. My daughter Gina and her husband Dave attend Chatham Baptist Church, for the past six plus years, and we have been worshiping with them almost every weekend as we have been there to help with their triplets since the beginning of her bed rest in March of ‘98. So in September of ‘99 I asked my friend a senior Elder member of Chatham Baptist Church former Pastor Dr. Rev. Harold Cameron (who has founded over 5OO Baptist Churches in Illinois) what we should say at his old alma mater Class of ‘53. I did not want to upset any Southern Baptist person or anyone about what we witnessed in Medjugorje. His reply: “Just tell the truth”. This honor went real well and we assured them the word “convert” does not mean that you must be a Catholic but to change your heart. They wanted to know why the Blessed Mother only appears to uneducated Catholics. Lore had details to assure them that Gospa has appeared to many children who have no ties to the Catholic denomination. When Lore showed them her rosary that the chain, holding the beads, has now turned to gold two years after returning to Illinois. One of them was very moved. They (the doctoral candidates) were so well versed as each of them was required to read, before our appearance in their class, about previous appearances of the Blessed Virgin Mary. Each good Baptist had to have read about one of the appearances and each one Baptist was assigned a different appearance each. We did find out that the Southern Baptists are working on a joint statement like the one the Lutherans and Catholics already have in October 1999. One night, after dark in Mostar, Moira was lost and so she stopped, her van, by a well lit fruit stand in front of a small well stocked fruit store. Moira first thanked them for being open during the curfew and praised God aloud, for this store being there for us at that moment. She then asked if the street we were currently on was still a thru street. The two men told her yes and before we proceeded. Moira then thanked them again by verbally giving them her blessing to them for a long life, good health and prosperity. Now you have to remember anything then that moved, at night, was a target. No one could see the painted logo of “Nobody’s Children” on the side of her van at night, even with the full moon in the tree covered streets of early October in Mostar. We all knew this; so this was the most stressful moment of our whole trip, in my opinion. Remember Dr. Cahill is deaf and he surely wanted to know what was happening, in that why were we still in Mostar, after dark. The only way he could know of what was being said in the dark was to shine a flashlight on one’s lips so that Dr. Cahill could read our lips. The van did have windows all around and seeing a lit face in the darken streets of Mostar during a NATO curfew is not good for one’s longevity. Evil people used long rifles to hit still targets at night in ‘96. So we come to find out that we were in a dead end alley. Moira immediately turns the van lights off. She turns the van around, in a small area, and races back down the alley past the two men and yells out “cancel my blessings” as we all laughed. Dr. Cahill now turns on his flashlight and shines his flashlight on my face and asked me to tell him why we are all now laughing. Lore yells to me to tell Dr. Cahill that we will tell him later and he then turns the flashlight, while smiling, on himself and says: “Read my lips” as he then turns off the flashlight so we could not read his lips, nor did Dr. Cahill say anything which made us laugh even more and he was now laughing at his own joke. He did turn the flashlight on each persons face while laughing to see if anyone was going to tell him what was so funny. He knew we did not want the light on our faces at that moment. We all felt bad that we were not able to communicate, with him, until we were out of Mostar. Moira got us out of town, that night, with no lights on. Don’t forget the full moon. One afternoon while we were on the way back to Medjugorje and I was looking forward from the back (2nd) seat when Dr. Cahill noticed Moira was putting on lipstick while, at the same time, holding a small mirror with her other hand, while driving up a hill on a single lane gravel road on a mountain curve. Dr. Cahill, who was behind me, motioned to me and pointed at Moira? I said to Moira: “Who is steering?” She said: “Jesus” and smiled. I do firmly believe that if you were blessed to be on that trip you would be telling anyone who would listen about what happened also. If you think this is the sin of pride let me know. Those eleven days in former Yugoslavia was nothing like what my former Army friends saw back in the sixties when they traveled there to purchase fine warm sweaters, which were then inexpensive. We never would have been asked to testify in Louisville had we not been blessed to hear, for ten years, Rev. Plass who founded Peace Community Church in Frankfort, Illinois. To see how the Lord used us, to unite two saints of different Christian denominations to do ministry in Thailand and then being honored to be asked to speak to Baptists doctoral candidates at their eighty-acre campus. You too would also be giving this true story out to anyone who would accept a copy. Several weeks prior to our departure to Bosnia I told Logan, the facilitator of the monthly Mens' Breakfast group at the local Church that I would not be present for the next scheduled Men's Breakfast. He inquired where we were going on "vacation". I told Logan that my wife had volunteered us to set up dental clinics in a town called Medjugorje in the former Yugoslavia. Logan immediately asked me if I would pray for him to help him find his biological daughter whom he had given up legal custody of some twenty years earlier. He continued saying that he has been looking for her all these years. He related that the town of Medjugorje has been visited by the Blessed Virgin Mary since 1983. I knew nothing of this and was surprised that his good Protestant leader was educating me, a former Catholic, who should be aware of this. A few weeks later while in Bosnia we were in the presence of one of the six visionaries who daily receives apparitions from the Blessed Virgin Mary, the Mother of Jesus. We wrote down our prayer requests which included that of Logan's and placed them into an envelope and passed them thru the crowd in this large room where several hundred Catholic Christians were present on their knees in complete silence. After the apparition of the visionary arose from her trance and announced the Blessed Mother's daily "message" to the crowd and indicated that the Virgin Mary said, "I will give these prayer requests to my Son." Upon my return home while attending the following Sunday morning worship service, Logan attended with his long lost daughter and newly introduced granddaughter who were both present and going to be baptized that morning. Later Logan informed me that his daughter was an abused woman. Her husband had been in a serious car accident resulting in a near death experience and decided to end his alcohol addiction and to amend his ways. Logan further stated that the car accident had occurred while we were in Bosnia at the same moment when we related that his prayer request was given to the Blessed Virgin Mary who had stated thru the visionary, "I have given your requests to my Son." Logan and his family were changed; he was overjoyed and grateful. I spoke at the next Men's Breakfast about the trip to Bosnia and the blessings received by Logan as well as the "prayer requests" granted. Logan and his wife have now gone to be with our Lord and Savior but only after being granted their life's desire to be reunited with their long lost daughter and the added blessing of meeting a granddaughter they never knew they had. Praise JESUS!! !